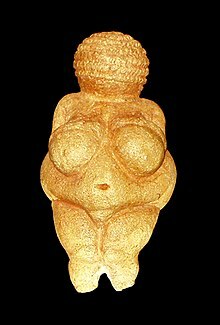 Evidence of burial with grave goods and the appearance of anthropomorphic images and cave paintings may suggest that humans in the Upper Paleolithic had begun to believe in supernatural beings. 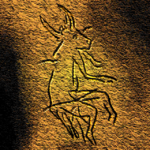 The cave paintings of Chauvet have been dated to 32,000 and those at Lascaux to 17,000 years ago. ^ Uniquely Human. 1991. ISBN 0-674-92183-6. ^ "FindArticles.com – CBSi". findarticles.com. ^ a b c d Karl J. Narr. "Prehistoric religion". Britannica online encyclopedia 2008. Archived from the original on 2008-04-09. Retrieved 2008-03-28. ^ "The Religious Mind and the Evolution of Religion" (PDF). ^ "An early case of color symbolism" (PDF). ^ "Ritual, Emotion, and Sacred Symbols: The Evolution of Religion as an Adaptive Complex" (PDF). ^ The Prehistory of the Mind: The Cognitive Origins of Art, Religion and Science. Thames & Hudson. 1996. ISBN 0-500-05081-3. ^ Miller, Barbra; Bernard Wood; Andrew Balansky; Julio Mercader; Melissa Panger (2006). Anthropology. Boston Massachusetts: Allyn and Bacon. p. 768. ISBN 0-205-32024-4. ^ "Upper Paleolithic Art, Religion and Semiotics". www.originsnet.org. ^ a b "When Burial Begins".